I am now taking my position as freelance film-dramaturg seriously. It is my belief that any move can be good, and that every movie SHOULD be good. It doesn’t cost anything extra, it doesn’t hurt your chances of your success. Even if it’s not going to make you any money, your movie should still be good. A dramaturg, in this context, functions essentially as an in-house critic: someone whose job is to remain at a remove from the material in a way that directors, actors, and writers can’t, to insure, in a broad way, that the themes, ideas, concepts, & al. are all concomitant with each other. Right, so, first: the clothes. Dune actually takes place twenty thousand years in the future, but that doesn’t really make much of a difference. Remember how in, 1970 say, no one could have predicted what fashion would look like in the late 1980s? Twenty thousand years is even longer than that. “Modern,” in this context, doesn’t make any sense. Maybe it’s weird for them to be wearing 19th century clothes twenty thousand years in the future, but how would that be any weirder than them wearing 21st century clothes twenty thousand years in the future? Star Trek takes place three hundred years in the future — if everyone in Dune was dressed like people in Star Trek, it would still be weird. One of the things that twenty thousand years lets you do is not worry about natural extrapolations. Fashion evolves, yes, but over twenty thousand years it’s going to evolve in a way that is completely and utterly unpredictable. That’s one of the reasons that Frank Herbert set Dune twenty thousand years in the future instead of, say, five thousand years in the future, or one thousand years in the future. He set it so far ahead that you couldn’t ever possibly say, “Well, why are they dressed in 19th century clothes?” Well, who the hell knows? It’s twenty thousand years in the future — 19th century clothing could have come into and out of fashion a thousand times during that period. The clothes are clearly tweaked versions of early 19th century fashions, and there’s a lot to what those fashions symbolize. They are meant to be representative of a stagnant culture (genetic and cultural stagnation being an over-riding theme of Dune) — they’re baroque and complex, a culture’s way of making up for its lack of progress with over-decoration. They’re old-fashioned to our eyes, yes — because they are intended to evoke in us a sense of stuffiness, a sense of formality, a sense of Empire. 19th century clothes look that way to us, and modern clothes do not. Dune isn’t obligated to reflect any kind of reality; Frank Herbert set the story twenty thousand years in the future precisely to free himself from that obligation. Compare these clothes to the hyper-modern fashions in another movie with spectacular design, Luc Besson’s The Fifth Element. 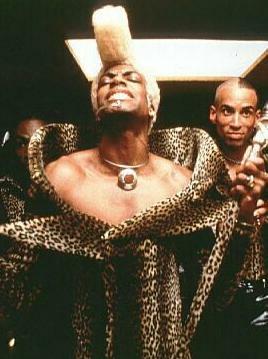 Chris Tucker, actually doing a good job. These aren’t even the best pictures. Besson’s The Fifth Element is an abundant profusion of strange fashions, because he’s trying to evoke precisely the opposite experience that Dune does. Besson’s near future is, in its way, an extrapolation of our future — but it’s one in which fashion and science have evolved to make it something beautiful and alien. A weird, shallow, but beautiful world whose intricacy is necessarily worth saving. In contrast to the explosion of near-future weirdness in The Fifth Element, Dune strives for a staid, stifling uniformity — not because such fashions are likely twenty thousand years from now, but because of what those fashions suggest to us. In that context, the rest of Morel’s statement — that he’s going to be consulting with scientists and futurists about what the technology of this world will look like — is equally misguided. When Stanley Kubrick made 2001: A Space Odyssey in 1968, he also consulted with futurists and scientists to help build the world, and extrapolate what life would be like thirty-three years in the future. They still didn’t get it quite right — but Kubrick wasn’t interested in creating a world that was accurate, so much as it was detailed. He was making a movie about what our (1968-our) near-future would look like, and so was specifically trying to modify what his audience expected to convey the sense of a direct evolution. Again, with Dune‘s twenty-thousand year gap (twice as far from us as we are from the beginning of civilization) no futurist or scientist could rightly have even the remotest idea how science or technology might change — what new things might appear, what things might disappear, what might be rendered obsolete, what might be discovered. The two hundred century gap is meant to free the Dune universe from any constraints that practical science might impose on the narrative. On a timeline that long, arguments like, “Oh, faster-than-light travel is impossible” or “You can’t build a flying ship that uses bird-wings” are rendered absurd. The far-future setting is a license for the author to literally construct any kind of world he likes. That’s what I find worrisome about Morel’s statements — not that he’s wrong to consult with scientists, per se, or there’s any problem with wanting to build a detailed world. It’s that he’s mistaken accuracy for precision. Dune is a rich world, full of detail, interconnected and well-designed — but it does not and, more importantly, does not need, to resemble anything like our world, or anything that we might extrapolate from our world. Lynch’s Dune is, I’m serious, a visual feast. Cliché but true. The SciFi adaptation a few years back was a fanboy Happy Meal, with everything a Dune reader could want in terms of source faithfulness. But the production design and costuming of Lynch’s version was superb, and there are images that still endure in my mind 20+ years later. The world of Dune should look strange and wonderful, not built on the ethos of 2011, or even necessarily that of 19th century royal courts. It doesn’t need a Lynch or an H.R. Giger per se, but it does need that kind of uniqueness of vision. Having never sat through the Lynch Dune, but thoroughly enjoyed the Scifi miniseries (indeed, one of my favorite college memories was sitting with my housemates and watching it as a marathon on a Sunday – he sun came up, the sun went down, and I never got out of my pajamas), how do fans of the book generally compare them? The SciFi Dune was quite strikingly faithful to the book, as mentioned, and on-topic with Braak’s post, it too had some pretty choice costuming. Some whiffs also, like the weird triangle that hovers behind Matt Keeslar’s head for a while, although he does make a good Feyd. 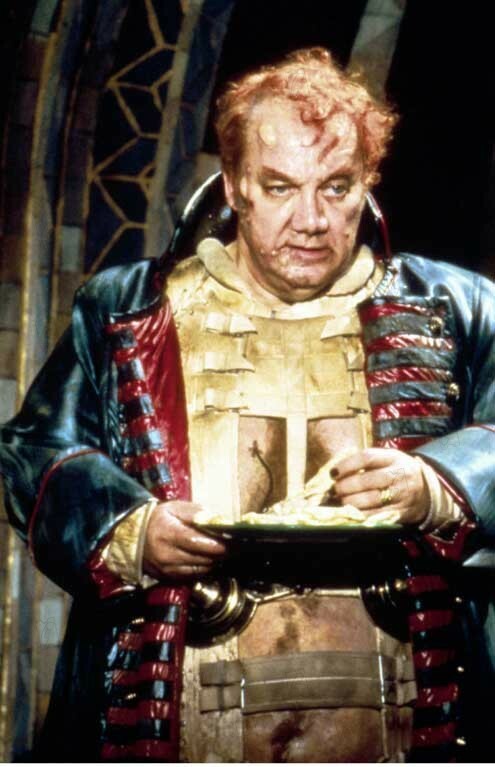 So if you’re a textual purist, and you don’t mind Baron Harkonnen’s Shakespearean rhyming-couplet asides — not in keeping with the book, but still very much in tune with the “Macbeth”-style court intrigue — the miniseries is for you. The Lynch Dune is like a fever dream experienced by someone who once read Dune. Vast deviations from text, but still an overall dream-logic gestalt that “gets” the book, which had long been judged unfilmable. Production-design nerds and art cineastes still hunger for the Jadorowsky version with Giger, long planned but then abandoned — the space-opera “Lawrence of Arabia” that might have been.